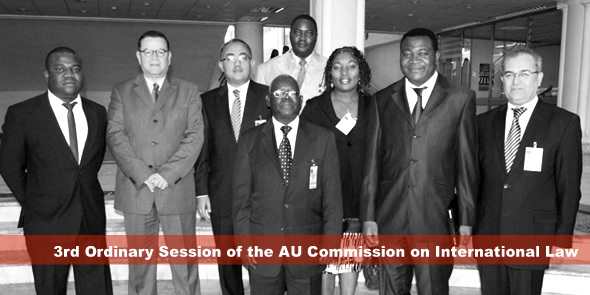 As part of its functions, the AUCIL is to enhance the progressive development of international law in Africa. In addition to other objectives, the AUCIL is established to encourage the “teaching, study, publication and dissemination of literature on international law, in particular laws of the Union with a view to promoting acceptance of and respect for the principles of international law …” (emphasis mine). Article 5(1) of the Statute places an obligation on the AUCIL to identify and prepare draft instruments and studies in areas which have not yet been regulated by international law in Africa or been sufficiently developed in the practice of African States. To assist in the actualisation of this objective, Article 9 mandates the AUCIL to “co-operate with universities, institutions and other educational and research centres as well as with bar associations and other associations of lawyers” in the teaching of international law and African Union law. Neither the AUCIL Statute nor the Rules of Procedure of the AUCIL (AUCIL/Legal/Doc.4 (III) made pursuant to Article 19 of the AUCIL Statute which creates the organisational structure of the AUCIL provide any guidance on the modus operandi for such co-operation. In my view, due to the educationally oriented nature of the objectives of the AUCIL, it is important for the AUCIL to propose a regulation to the Assembly of the Heads of State and Government of the AU (Assembly) which details the procedure not only for approaching the AUCIL by supposed partner institutions, but also setting out the standards and guidelines for the curriculum. This regulation should also serve as an opportunity to clarify some vague terms in the statute such as the phrases “International and African Union Law” and “laws of the Union” which are not defined. How does the foregoing relate to the AIIL? The proposal for the establishment of the AIIL was made by the Republic of Tanzania to the AU and the Decision to proceed with its establishment and to report progress thereon to the Assembly in July 2012 was made vide Assembly/AU/14(XVIII) Add. 5 in January 2012. Based on the available materials from the AU website, it is not apparent that any reference was made to the provisions of the AUCIL Statute by the proposed AIIL in approaching the Assembly. Notwithstanding that, I argue based on that, objects of the AIIL, that its establishment purports to take advantage of the provisions of Article 9 of the AUCIL Treaty on partnership in relation to the study and teaching international law in relation to the AU. In proposing its amendments, the AUCIL can draw some inspiration from the elaborate list of subject areas that the AIIL has proposed to develop and teach in partnership with associated faculties of law in selected African universities. It is also high time the AUCIL started taking positive steps to actualise the vision of the organisation and one hopes that by July there would be some progress report to the Assembly on the AIIL. Olabisi D. Akinkugbe is a PhD candidate at the University of Ottawa, Canada. He is also a member of the Human Rights Research and Education Centre of the University. He obtained an LLM degree from the University of Toronto, Canada in 2008 and LLB from the University of Lagos, Nigeria in 2002. BISI, YOUR PIECE IS BY ALL STANDARDS A BRILLIANT OUTING. WE ARE KNEW U’D TRAVEL AND ARE GLAD THAT YOUR GOING PLACES IS COMING THIS EARLY IN THE DAY. ON THIS, OUR OPINIONS CONVERGE. WELL DONE, BRO. Brillant write-up.Keep it up bro.God be with you. I’m so impressed with your write-up, It is time for Africa to implement our international laws into practice. I wish my PIL class at University of Cape Town had taught me about the the AU, and its laws. In Europe in my LLM we learn about the EU and its law, and then also about the Council of Europe. Certainly, I would like to know more about the curriculum that is developed, so that I can encourage my lecturers to implement it. Also, there is a lack of information or motivation in SA to work in the AU or SADC, where in Europe there are traineeship programmes and information on how to work within these organisations, and contribute to their acquis.